Do you have a “hard” to “buy for” person in your family, a young professional, an upcoming graduate or a person who needs help with their Wardrobe? I can help! Consider giving the gift of a “Color” or “Style” Analysis.” Color Analysis includes a Palette of Color Chips that identifies a person’s 40 best colors. A gift that will help someone know what colors light them up and flatters their appearance. 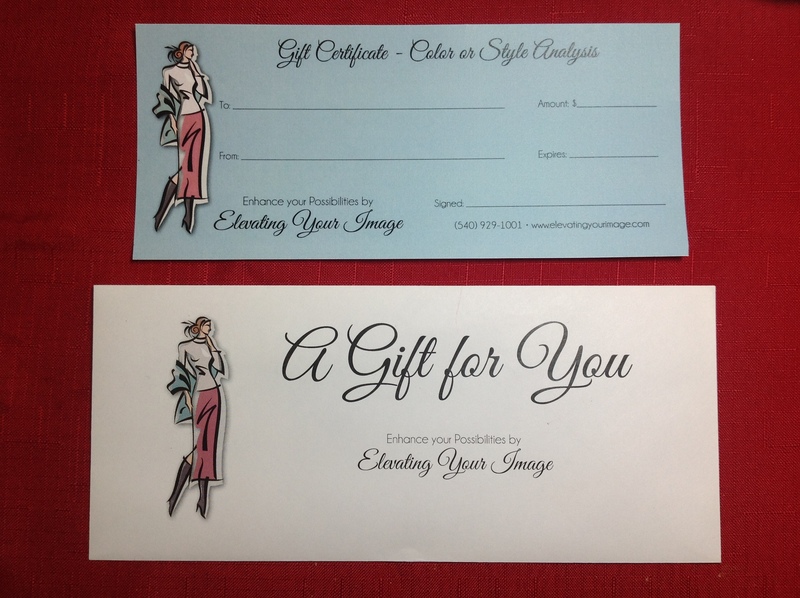 Gift Certificates can also be used for Color Me Beautiful Products if purchased through Elevating Your Image!! In-person Color Analysis COST: $125.00 – Includes a 2 hr Consultation, Color Analysis and Color Palette of Your 40 Best Color Shades.